← What’s that got to do with the price of mithril in Eregion? Apologies for the unplanned hiatus here—this term has turned into something of a gong show, and I’ve been snowed under with various committees and my teaching. As a result, I have a handful of half-finished blog posts about The Lord of the Rings starting to clutter up my desktop … I’ll return to them when things ease up, which means whatever semblance of chronological order I’d been maintaining will be out the window, but that doesn’t bother me overmuch. For today, just a short post on everyone’s favourite subject: spiders! Frodo, about to totally regret going to Australia for holiday. 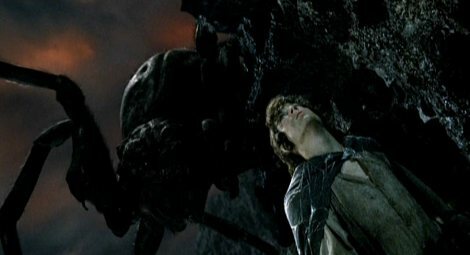 Yes, as you might have guessed, we just passed through Shelob’s Lair and left Frodo cold and apparently dead in the pass of Cirith Ungol while Sam takes up the Ring and the quest. We start The Return of the King this week and head into the home stretch. 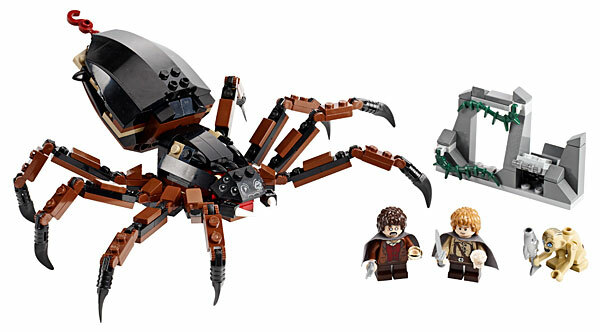 I’ve got spiders on the brain because one of my students asked whether Tolkien, in giving us Shelob—who I maintain is one of the most terrifying inventions in all of fantasy fiction—was citing a certain mythological and legendary tradition of monstrous spiders. My gut reaction was to say yes—because obviously arachnophobia is a common element of the human condition, yes? But I caught myself, realizing I could not think of any examples outside of twentieth-century popular culture; and the more I thought about it, the more I began to think that no, spiders in myth tend at worst to be trickster figures—the African god Anansi, for example, or the Lakota trickster Unktomi. Most central to the western tradition (and to biological taxonomy) is the woman Arachne, a master-weaver who challenges Athena and either (1) defeats her and is struck down by the goddess in a rage, but is resurrected as a spider when Athena feels remorse, or (2) loses to the goddess and is transformed into a spider for her sin of pride. The spider is less significant, then, than her web—hence the tendency toward the trickster figure, something that has also been suggested with regards to Norse myth. One etymological interpretation of Loki’s name connects it to the pre-medieval Swedish vernacular, in which “spider” is “locke.” (As an aside, some preliminary investigation into my own name’s origins suggest that “Lockett” is a diminutive of “locke” and is similarly connected to Loki. So there you have it: Tom Hiddleston and I are practically brothers). Tolkien’s spiders, it goes without saying, are explicitly and terrifyingly monstrous. One interpretation of this derives from a story told (not by Tolkien) to his biographer Humphrey Carpenter, that when Tolkien was just a small child of four or five in South Africa, he was bitten by a tarantula. However, Tolkien would later refute this, saying that while the story might have been true he had no memory of it, and that he first introduced the giant spiders into The Hobbit because his son Michael was terrified of them. There agelong she had dwelt, an evil thing in spider-form, even such as once of old had lived in the Land of the Elves in the West that is now under the Sea, such as Beren fought in the Mountains of Terror in Doriath, and so came to Luthien upon the green sward amid the hemlocks in the moonlight long ago. How Shelob came there, flying from ruin, no tale tells, for out of the Dark Years few tales have come. But still she was there, who was there before Sauron, and before the first stone of Barad-dur; and she served none but herself, drinking the blood of elves and men, bloated and grown fat with endless brooding on her feasts, weaving webs of shadow; for all living things were her food, and her vomit darkness. Far and wide her lesser broods, bastards of her miserable mates, her own offspring, that she slew, spread from glen to glen, from the Ephel Duath to the eastern hills, to Dol Guldur and the fastnesses of Mirkwood. But none could rival her, Shelob the Great, last child of Ungoliant to trouble the unhappy world. Like her mother, Shelob has little care for power or possessions or treasure, living only to consume and destroy: “Little she knew or cared for towers, or rings, or anything devised by mind or hand, who only desired death for all others, mind and body, and for herself a glut of life, alone, swollen till the mountains could no longer hold her up and the darkness could not contain her.” She is pure appetite and little more: Freud might say she is pure id, with no consciousness outside her monstrous lust. All of which is rather terrifying, but leaves us with the question: why the spider-shape? For indeed, it does seem here that Tolkien is doing something quite original, or at any rate not borrowing from a set of extant mythological tropes. I want someone far smarter about this sort of thing than me (and more willing to do the research) to inquire as to why spiders have not figured as nightmarish monsters in our mythic and legendary collective imaginations more than they have. Considering just how rampant arachnophobia seems to be today, and how frequently spiders have figured as objects of terror in twentieth-century narratives from John Wyndham’s Web to a host of B-movie monsters (to say nothing of the giant spiders in the Harry Potter series), I have to wonder if this is a uniquely modern nightmare. Humanity has always had the fear of being consumed, but when we look at myth and legend, those monsters doing the consuming are more often than not giants, ogres, trolls, and suchlike; nary a spider to be seen. When we’re not being devoured by giant human-shaped things, the predators tend to be serpents, giant birds, or other such massively-proportioned animals … all of which suggests the lingering nightmare of being eaten by wild animals on one hand, or fellow humans on the other. So why is it that spiders only start to loom large in our nightmares so relatively recently? Cheers! Great read. Loved the Loki bit. haha! 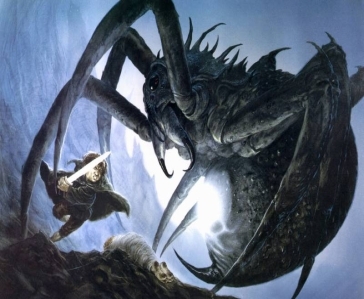 Just wondering if Tolkien may have encountered giant spiders in Japanese fairy tales. Apparently, tsuchigumo (translated as “earth spiders”) were often revealed to be giant spiders. Any thoughts on whether Tolkien would have studied such Japanese fairy tales?